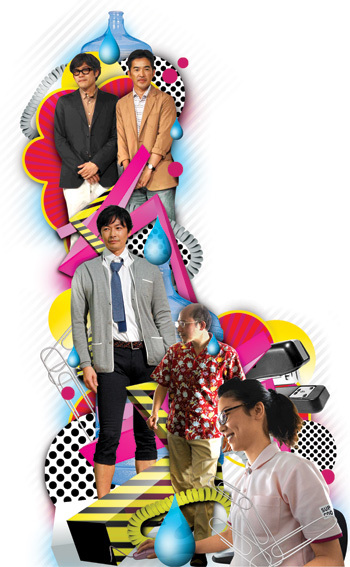 Japan has a simple way to save energy: Make every day casual Friday. Ryotaro Kishi ditched his jacket and tie. The 37-year-old employee of the telecom company NTT in Saitama, Japan, is entrenched in the country’s conservative business culture, so his move is a pretty big deal. But the land of formality is also suffering a post-earthquake energy crisis so drastic that many buildings can’t be cooled below 82 degrees. Kishi wants to dress down even more, but instead, he’s stuck sweating at his desk. “I can’t look more casual than my clients do,” he says. That’s too bad: His government wants everyone to chill out. Under the banner of a campaign called “Super Cool Biz,” it’s suggesting that people arrive at work earlier, before the sun beats down. It’s telling them to eat icy desserts. But most notably, as if this were its own sort of after-shock, it’s asking them to wear sandals and shorts and Hawaiian shirts–to work! Attire in Japan is seen as a sign of respect to your superior, but that’s not the government’s concern. To avoid nation-wide blackouts, it must reduce energy use by 15% this summer. This isn’t an entirely new idea. In 2005, the Japanese government launched a predecessor, Cool Biz, with a subtler sartorial assault (nix the jacket and tie) and a headier goal (fight global warming by using less air-conditioning). Most people dismissed the idea back then, but polls now show about 66% worker support. It has cut roughly 5 million metric tons of greenhouse gases–which goes to show that cultural changes can lower energy use as much as technological ones. Trouble is, culture can move slower than technology. “There is still resistance from mostly middle-aged men and women who are worried that Super Cool Biz promotes sloppy looks and manners,” says Ministry of Environment spokesman Kazuharu Aizawa. No doubt, those worries aren’t mollified by the Men’s Hairdressing Federation of Japan’s hyped Super Cool Biz 2011 cut–short on the sides, teased on top. But Kumi Saito, executive director at the noodle maker Oguni Seimen in Niigata, hopes acceptance will grow. “If my clients approve of my Super Cool Biz fashion, or if they are into it themselves, I can dress more casually than last year,” she says. So that’s how influence spreads: Even she is someone’s client. Follow this writer @daniel_krieger and @fastcompany on Twitter. Beat The Heat (And Save Energy): Show Some Leg!